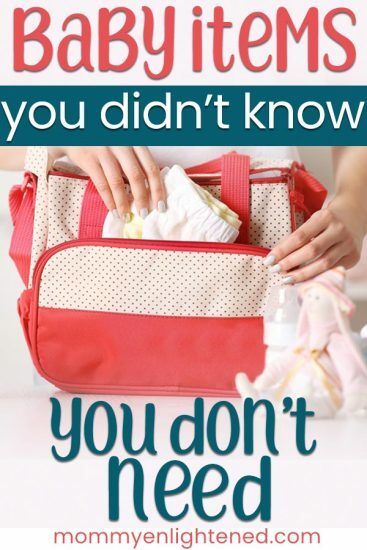 There are plenty of unnecessary baby items that ended up collecting dust in our home. My anxiety associated with having a baby was pretty high, and being able to buy lots of baby things gave me a feeling of “control” and comfort over the situation. I thought that as long as I had EVERYTHING possible that my baby could need, I was setting myself up for success. Instead, I felt overwhelmed because there was too much clutter and noise. I don’t want YOU to have to deal with too much clutter and noise, so I thought I would give you a list of unnecessary baby items NOW, so that hopefully you don’t have to do what I did. I did want to add…what I consider a unnecessary baby item is different than what you may consider unnecessary. While that’s true, many of the products on this list are things I am pretty sure NO one uses. There are affiliate links in this article. Read more about this in my disclosure. It may surprise you that a bottle warmer is indeed one of the most useless things you can get for your baby. The idea of a bottle warmer is that it allows you to heat up breast milk that has been stored in the fridge or freezer quick and efficiently. While it’s a great idea to give groggy parents something to make their lives easier in the middle of the night, it doesn’t work. By the time the bottle WARMER has warmed up enough to start heating the bottle, you could have been finished already if you used the method I outlined below. And that’s just the warmer – you have to wait EVEN LONGER for the bottle itself to heat up. We got a bottle warmer at our baby shower from a coworker of mine. Looking back, I wonder if she had re-gifted me something SHE had never used, as she was also a mom and had to know how useless this item was. This was probably THE most pointless gift that we received (well, except for #4 on this list). The bottle warmer is a great thought, but it just doesn’t work. Heating up bottles will be a thing in your life (or at least for most of us). I recommend holding the bottle under warm water in the sink. Make sure you gently swish it around so that it can heat evenly. Do NOT use the microwave to heat up a bottle. This causes uneven (which translates to unsafe) heating of the bottle and increases the risk of scalding your baby. A wipe warmer has a compartment where you can keep wipes. You add water to the warmer, which helps keep your wipes warm and moist. Some wipe warmers have a nightlight (like this one), but they are only lit enough that you can locate your warmer. There are a couple of downsides to wipe warmers. First off – they can develop bacteria, which is why cleaning and maintenance of these machines are more time-consuming than NOT using one in the first place. They are also prone to drying out the top layer (or two) of your wipes, which is pretty wasteful. Lastly, the wipes in your warmer will take FOREVER to heat up, so if you aren’t diligent about keeping it stocked, you aren’t going to be able to utilize it anyway. It’s definitely an unnecessary baby item. We warmed the wipes in our hands. Before even removing our baby’s diaper, we would grab a wipe and ball it into our (clean) hands. Once it was time to wipe, the freezing cold wipe was no longer freezing cold. There was no maintenance to do it this way and no waste. A diaper pail is used so that you can store dirty diapers in your home without the smell. I don’t want to say outright that this is a useless product. I understand the need for one if you live in an apartment complex or somewhere where it is difficult to take the trash out. Usually these little diaper vaults do a better job at keeping the smell in than a normal garbage can would. They usually have specific fancy bags you have to buy – and they aren’t cheap. Take your garbage out. Anytime we have a poop diaper, it goes straight out to the trash. If there is something going on where that is simply not possible, I stick the diaper in the garbage can and make sure it goes out later that day. If neither of these sound like good options to you – go ahead and pick up a diaper pail here. We had a bassinet for both of our babies. The first bassinet was gorgeous, but our baby grew out of it in four months. A bassinet can be useful if you want your baby close to you and you need something smaller to keep your newborn in, as long as you recognize how short-term this product will be. A bassinet is not a TOTALLY unnecessary baby item – it depends on your family’s needs. Personally, I think there is a difference between a bassinet that is practical and one that is not. If you are going to buy one at all, buy a practical one. This is the one we got for our second child. And although “rock n play” is in the name, it is NOT a rock n play and it DOES meet safe sleep standards. We spend a lot of time with my family who lives an hour away. That meant that I had a newborn that needed somewhere to nap. We needed something compact that could travel easily. It’s not the prettiest, but it was a safe and comfortable sleep space for our baby. The alternative is to just put baby in a crib from day one. There’s absolutely nothing wrong with this, and you will get a lot more mileage out of it. Some parents cosleep or use a cosleeper, but this does go against the AAP’s safe sleep recommendations so I can’t recommend that here. A baby bath towel is softer and smaller than your typical towel, which is why some people choose to buy them. Not only that but they are SO cute. For our first baby, we got a little duck one, which made for some good photo opportunities. The reality is though…it’s NOT a necessary baby item (although if you reeeeally wanna see a cute duck towel you can find one here). You can use an adult-sized towel and it works just fine. Actually, from a practical perspective, we preferred the adult towel as it was easier to keep our newborn warm while drying her off. This will not apply to everyone, but if your baby was born at term and is healthy, it’s likely that newborn clothing will not fit for long (if it does in the first place). Newborn-size clothing is SO cute, which is why I suspect we received so much of it. Your baby will grow so quickly, and over 90 percent of babies aren’t using newborn sized clothing by the third week anyway. 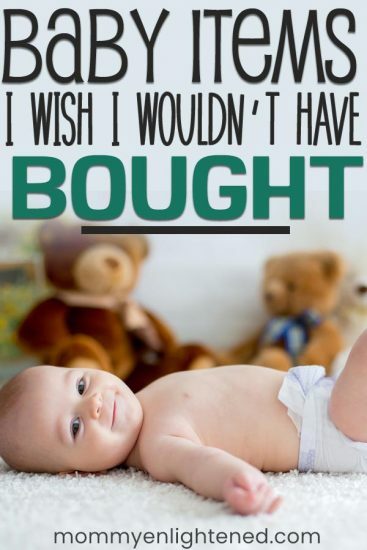 Ask for (or buy) starting at 0-3 months. Personally I would stick to five or six onesies, two full outfits, and 4 pairs of pants. Four or five pairs of pajamas, baby socks, and a couple of nightgowns are all that you should need (and that may be overkill). Baby shoes are not good for your baby’s development – which is enough of a reason that they made it on our unnecessary baby item list. Yes, I KNOW how adorable tiny shoes are, but your baby doesn’t walk. Shoes should NOT be worn until your baby is ready to walk outside. Shoes can impede your little one’s growth and ability to walk, so it may take longer before your child is walking well. Barefoot is best for your baby. Once they are ready to walk outside – definitely put some shoes on them to help protect them, but don’t do it before then. Okay, you are going to get some of these anyway – so definitely don’t waste the money on buying your own. Receiving blankets are usually so small that you can’t really use them for much after the first six months. Some people use them for swaddling, but I was terrible at swaddling by hand. I actually reviewed the best swaddles for newborns, but my favorite will always be my Ollie. I suggest grabbing an actual swaddle for swaddling and purchase normal sized blankets that your baby can use when they are older. I am guilty of purchasing BOTH of my kids an infant snowsuit. We never used either of them. Ever. While it’s a nice idea that you can purchase something that will keep your little one warm in the snow, what’s the likelihood that you are actually going to take a newborn outside for a snow day? The best choice is to NOT put your newborn in a position where they would NEED a snowsuit. But. If you know for a fact that you will need one – get one. For a somewhat minor snow exposure, use a warm blanket to keep your newborn baby covered. A snowsuit is usually an unnecessary baby product. I could NOT believe this was a thing. A diaper stacker is a pretty way to stack your diapers. These usually are in the form of a basket (caddy) or a tent looking thing that will hang from your ceiling. I tried to think of a situation where this could be useful – but I am coming up dry. Totally unnecessary baby item. For our first baby, we kept extra diapers in a cupboard that was easily accessible. We ended up getting lazy with it and just stored the bag of diapers in that cupboard. It’s important to get things that will help SAVE you time – not force you to invest in MORE time. I recognize that SOME newborn babies may benefit from baby lotion, but it is usually not necessary. It is totally normal for babies to experience some dry patches, and they usually go away on their own. IF you are going to use lotion, it’s important to grab one that is perfume and dye free (like this one). If your baby’s skin still seems to be incredibly dry, talk with your pediatrician about adding a baby oil or lotion to help. A crib bumper is a cushy surface that goes around the inside of the crib. The problem is…your baby will begin rolling around three or four months (some as early as two). There’s a very good chance that your baby could roll face first into the bumper, which can make them suffocate. Not only this, but your baby could get their head caught between the bumper and the crib. There are numerous ways that these are dangerous – without any real benefits. According to the AAP, there is NO place for crib bumpers in a safe sleep environment (and the breathable ones are JUST marketing – your baby can still suffocate). Luckily, most newer cribs are built better. There is less spacing between bars, so although your little one could get a leg stuck in it, it’s highly unlikely their head could get stuck between bars. There isn’t a safe alternative, but it’s important to check on your baby if they are in their crib and start crying. We made the mistake of NOT checking on our baby (at least not right away), and when we did find her she had a leg stuck between the bars. I felt SO terrible and wanted to make sure it could never happen again. After that we purchased a video monitor (this one is really nice). It gave me some peace of mind because I knew I could always check in on her without disturbing her. I am a big believer in breastfeeding HOWEVER you are the most comfortable. There is nothing wrong with breastfeeding openly in public, and this was what I chose to do. Often, it’s less stuffy and I imagine more comfortable for baby to breastfeed sans cover, but that doesn’t mean there is anything wrong with breastfeeding with a cover. A nursing cover can seem like an awesome investment if you prefer to keep yourself covered in public, but it’s not necessary. A light blanket (which I promise you will get plenty of) can do the trick just as easily. DO purchase a few nursing tanks or shirts (I really liked these ones) because they will likely come in use. I wore mine every day. These are little wipes that you can use for wiping your baby’s nose. They are softer and gentler on your baby’s skin. We had these in the emergency shelter for kids that I worked at. They were probably one of the most pointless things I have ever used. Wipes or tissues really do the trick. You usually have wipes on you anyway, and tissues are cheaper than a container of fancy boogie wipes”. There truly is almost NO reason for one of these. If you don’t have the extra thirty seconds to make formula by hand, this product may be for you. Those thirty seconds you save will be paid back when it comes time to clean or unclog your machine – which some users report happens frequently. The biggest reason I would never use a machine like this is that I cannot trust that it would give me a correct ratio (which some users report is a problem). I promise that making formula from hand is easy enough. Take your two hundred dollars and spend it on something like a nice baby swing or other interactive toy for your baby. What I consider a necessity you may consider a luxury. That’s the beauty of being parents – we get to choose what is best for our family.